Tips for making black and white conversions in post-processing? In image editors, especially powerful ones like GIMP and Photoshop, there happen to be a bevvy of ways to turn a color image into a black and white one, but not all techniques are the same. How do you analyze an image for black and white conversion to determine which black and white conversion methods would work best? What are some different methods for converting black and white images? When is black and white likely to enhance an image? What are the pros and cons of film and digital for B&W photography? 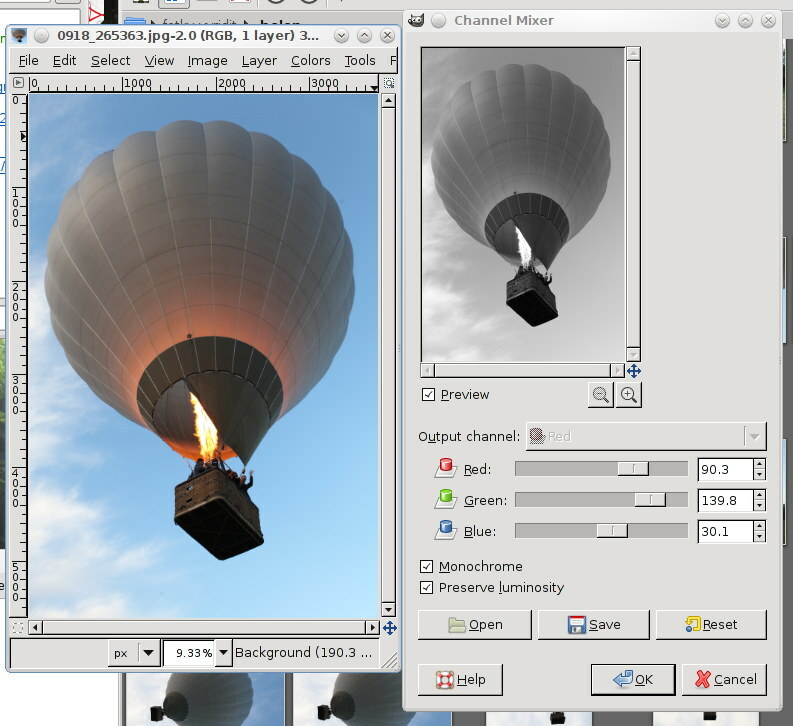 GIMP has a "Channel mixer" tool that allows you to convert to grayscale using arbitrary ratios. If you have areas where different colors dominate, you can use it to emphasize contrast. There's an example below, but it's really best to play with it and see for yourself. Checking "Preserve luminosity" uses just ratios of the channels, so you don't have to care about clipping the result by adding everything on 200%. It can take a bit of experimentation but I would recommend looking at each colour channel in isolation to give you a good idea where to start! The easiest method is to just drop your saturation to zero. That leeches all the color out of the image. It may not be the effect that you're looking for, however. Another method is to add the results of different color channels in various combinations to one another to make a single intensity value at each pixel location. Where R is the red intensity at a given location, G is green, B is blue, and I is your final intensity. Where those r1, g1, and b1 are constants for each channel. Where your T1 is a transfer function (mapping of one set of pixel values into another). Simple transfer functions are things like histogram equalizations, contrast adjustments, and other single-pixel modifications. This is all from a mathematics perspective, ie, you're doing modifications in a program or in something like Matlab. You can also see how the transfer functions could get increasingly complex, combining neighborhood information and the like. If you don't want to go that route (and I don't, not often, anyway), there are off the shelf solutions, in Lightroom or Nik. Here's a good review article on the last two, and this article and this article are also good primers. I'd suggest a film simulator, which simulates how various black and white films would respond to the given color signal. I use the iNDA plugin for Bibble, but it's based on a GIMP plugin I believe. It produces results that I like, it's very quick to try B&W on an image, and I like not having to think too much about all the parameters other answerers mention (YMMV of course). There are many great tips here. There is something I found lately which is quite nice and generate Black & Whites which rich and contrasty. Most of us know Luminosity Masks and use them for many things. But actually I found them to create also a stunning Grayscale / BW Conversion. The nice trick is to make really specific selection. It is a little bit hard by hand (Though doable using Calculations or the Channel Tab), but once you're doing it is amazing. Tony Kuyper has a nice post about it - Infinity Monochromes. He also has a tool to create those very specific Luminosity Masks. You can also use other tools tools like NBP Lumizone which allows you combining different Tonal Ranges for the BW image. Another concept I saw it automated BW using algorithm which tries to maximize the Contrast. I found it in a tool called Know-How Transfer VitaminBW. Have a look on its PDF Manual, the results are really something to appreciate. I work exclusively in black and white. I have used Photoshop, but currently use Photoline. It doesn't really matter which you use, but I've found the channel mixer approach to be difficult to control, and the desaturate method to have no control at all. 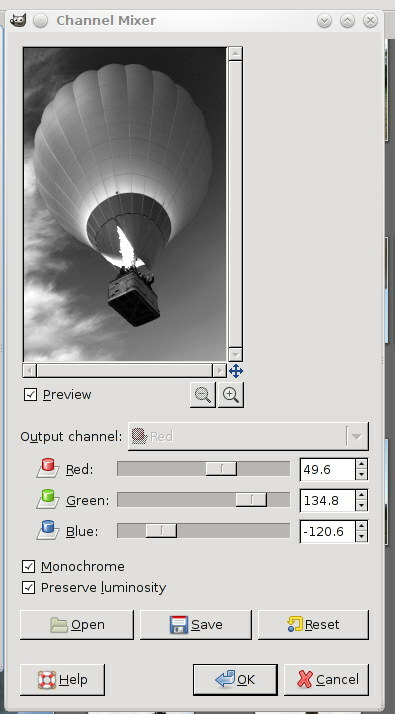 Both Photoshop and Photoline have a Black and White adjustment layer where you can adjust the values of 8 or so different colors for the conversion. I like this way best, but it shouldn't scare you off because it has so much control. I just move each slider and see what it does to a given image. The idea I use is to try to get as much separation as possible between the colors. In other words, each slider can be adjusted to bring out a certain shade of grey. For my photographs, I try to have a full range of grey scale luminance values, but there are no rules here; do what looks good to you. Using this approach, you can make a black sky a la Adams, or a white sky to get a pen and ink feeling, or anything in between. Not the answer you're looking for? Browse other questions tagged post-processing black-and-white or ask your own question. What's the best practice to take black & white pictures with a digital camera? What do the scene modes actually do? What's the difference between using black and white mode in-camera, and converting in post? Are there written guides or rules of thumb for setting color saturation, clarity, vibrance, etc. in post-processing (or in general)? Would a demosaic algorithm for black and white be useful? Black background post processing tips? What should I focus on when converting photos to black and white? Can I apply colour tone curves before black and white processing in Lightroom?